We propose you to become the real builder! So, just use all tips and place the block correctly. You will have to place it into the red outline. Are you already fascinated? Then do not waste your time and do it. Have much fun here while playing this game! Have you ever dream to take part in the creating of the new city? Well, now you have such a great chance. 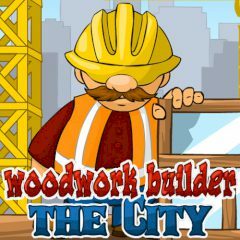 Just build the entire city in this fun physics puzzle game and drag the red objects inside the red outline to finish the levels. To connect 2 objects with a staple all you need to do is double-click between them. But sometimes you will need to build a steady framework in order to put the red object into the area. Just use all tips and become the real builder. We wish you good luck and do everything to vanquish this game.